The Interior of Fairlane house some amazing artwork. A few weeks ago, Alex from Alex Eats to Much and I ventured into Fairlane after ice cream for just some cocktails. What we were greeted with was amazing. Cocktails made with love and a sort of artistry you find in downtown cocktail lounges. We also learned about Negroni and Fried Chicken Night, Mondays, at Fairlane. Special Brunches and menu items also pop up sometimes. Also, there are WINE DINNERS!!!! I returned to eat on a Monday night, specifically for the Negroni and Fried Chicken, and what transpired was a fantastic meal with many dishes and cocktails. To start off the food extravaganza we started with a cheese plate (no charcuterie) and homemade biscuits with miso butter. The cheese plate highlighted four different kinds of cheese and some compliments like fig and mustard off to the side. Also as an appetizer was the homemade biscuits with miso butter. The biscuits came out warm and delicious. At some point I think we just want to eat biscuits…actually it moved them to the top of the brunch list. My date for the evening ordered the Fried Chicken which is served with Cole Slaw and a biscuit. The chicken was flavorful, not your standard fried breading. We skipped the Cole Slaw and the biscuit was still something to rave about. Have I mentioned how good the biscuits are? I enjoyed the Flat Iron Steak. It was a rich steak accompanied by scallions, baked carrots and fried onions on top. The dish is exquisite, flavorful and artistry at its finest. Dessert was split between two menus, dessert drinks, and food. Some dessert items include Millie’s Ice Cream, Mascarpone Cheesecake, and a Chocolate Pots de Crème. We split the Mascarpone Cheesecake. 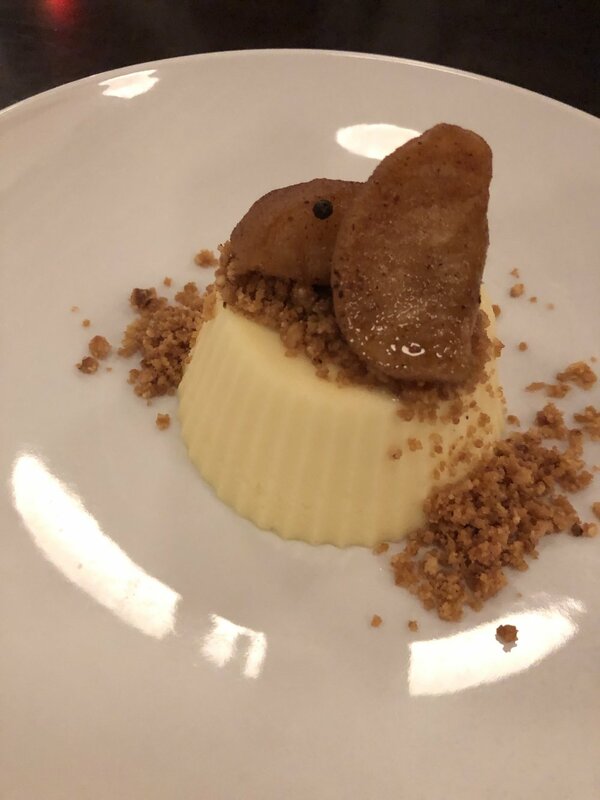 The Mascarpone Cheesecake was topped with cinnamon covered pears and graham cracker crust. We did stick to Negroni for most of the dinner. However, after dinner, we did retire to the bar for another drink where I enjoyed a Forgive Me for I Have Ginned. My date was able to have a Hitchhiker We All Scream, a great local beer, along with a neat bourbon. Fairlane also has a brunch menu, however during the week doesn’t serve lunch. For more information visit Fairlane’s Facebook or Instagram. Cheers! If you love dining out visit our Food and Drink page for more!